Nice Rack Canada started off 2018 with this compact, lightweight pedalboard system that is built to rock. This tasty little slab of guitar tone tools is a fly rig for Toronto rockers "The Swine". The legendary Les Paul & Plexi combination with this pedalboard does indeed produce some very fat tones for rocking of the classic variety. This series wired affair is packed with some of our favourite small box pedals that punch far above their weight & dimensions. 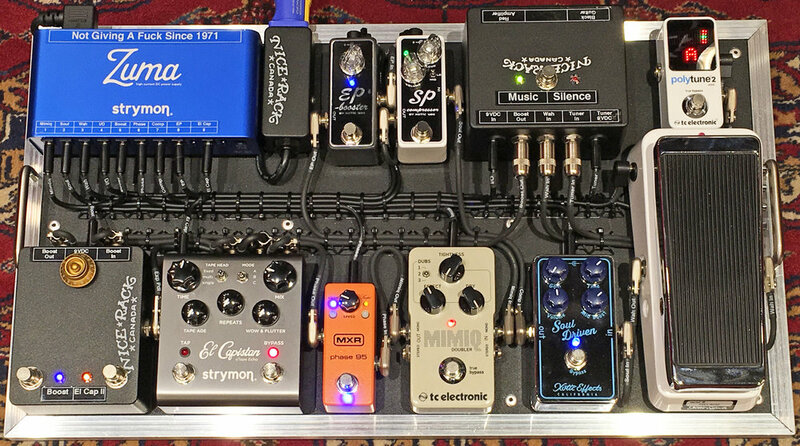 The signal flow is Guitar --> Xotic Wah --> Xotic Soul Driven --> Xotic SP Compressor --> Xotic EP Booster --> TC Electronic Mimiq --> MXR Phase 95 --> Strymon El Capistan --> Nice Rack Canada Clean Boost & Tuner Split to TC Electronic PolyTune 2 Mini --> Amplifier. The client wanted to emulate the tones of some legendary rock records of yesteryear. To help achieve this we introduced the Mimiq to help get the "overdubbed" sounds. Giving an extra dimension to a power trio's sonic depth. The SP Compressor & EP Booster are on all the time to help provide sustain & warmth to the tone. The MXR Phase 95 offers the user their choice of Phase 45 or Phase 90, Block or Script logo variations of the one of the most ubiquitous effects pedals ever made. The El Capistan has a custom Favourite Switch to double the number of Tape Delay emulations available in the compact footprint. Powered by the Strymon Zuma system PSU. This power supply is quickly becoming an industry standard due to it's lightweight & compact design. But more importantly Zuma's clean, quiet DC output with current headroom to spare for even the most demanding of modern pedal designs. When your tone is ready to put on some weight, while shedding pounds from your pedalboard contact Nice Rack Canada to help your tone be as big as it can be.